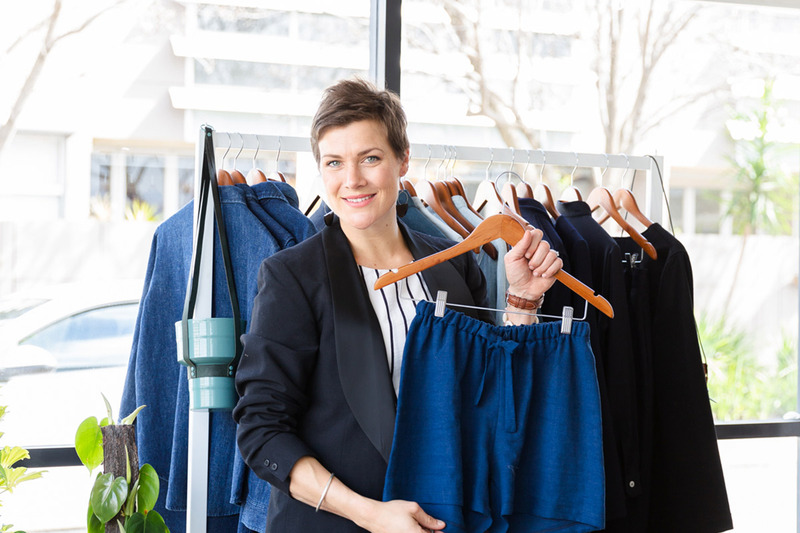 Like many mothers, becoming a parent inspired Erin Scammell, AKA The Stolen Stylist, to find her true calling in the fashion industry, and reignited passion in her career. In six short years, Erin and husband Lachie made six babies: four human and two business babies to be exact! Erin talks to us about finding start up inspiration and managing life with her very own Brady Bunch. Can you tell us a little about your career journey before marriage and kids, and where your career is today? Having children really seemed to consolidate my professional pathway. BC (before children) I had no professional clarity. Yes, I had completed two degrees, worked in media and education, but did I know what I actually wanted to do? Absolutely not! I was too busy worrying about what I thought other people wanted me to do! If I’d followed my own passions I would be living on a minimum wage in a blind attempt to make it on the silver screen…oh but there is still time! Let’s go back to the beginning. Where did it all start? It was Friday the 13th (yes, it really was!) when my husband, Lachie, and I returned home from our post-marital holiday (read: honeymoon) with glitter in our hair and optimism in our eyes. OK, so perhaps it was salt in our hair and sleep in our eyes but, hey, don’t let the truth…or something like that. Regardless, we thought our future was set. That was until my recently acquired husband landed a two-tonne excavator on his foot! What happened to that clear path you had planned for your life whilst on your honeymoon? It took months for my husband to recover, and several forks in the road later we were on a new trajectory. In the six years that followed we produced four children (under four years), relocated three times and started (and continue to run) two new businesses. Safe to say, we don’t do things by halves. Were you working when you had your first child and did you take parental leave from your employer? From media to education to starting my own styling business; quite the evolution! About a month before our first child arrived, I took parental leave from my job as an arts teacher. I had no intention of returning to the Department of Education, so allowed my registration to lapse, never to return to teaching. I decided, instead, to channel my energy into the conception of our two businesses (and a few more kids). How did having your first child, then your second and so on, change your career mindset/goals? After my eldest was born and decided to only sleep at night, I found myself walking…a lot! It was during those walks (and over many cups of coffee) that I reflected on my life, trying to understand who I was and who I wanted to become. In those contemplative moments, I realised my passion lay in an entirely different industry to teaching, and had been brewing for longer than I had realised. Fast forward to today and you now have four children and two businesses. Can you tell us a little about your businesses? Babies do funny things to people. For my husband and I, they entice us to want more babies…human babies and business babies! When I was pregnant with our third child, we launched Outside Developments, a one-stop backyard makeover business specialising in swimming pool installation. Soon after our fourth child was born (four months to be precise), we launched The Stolen Stylist, a personal styling business that provides sustainable solutions to style. What was the motivation behind you and your husband starting your own businesses? It’s simple: joy! Bringing joy to other people. Naturally, we also enjoy the challenge that comes with running our own business (cash flow, etc), but mostly it is for client satisfaction. How do you manage your Brady Bunch (four kids plus two businesses) effectively during the day? Our plate is now fuller than we ever anticipated and, with no family geographically nearby, the juggle is well and truly real. How do we do it? We tag team…a lot! When required we include our children at work: my eldest daughter recently joined me on a fashion shoot, while any given child will attend a site quote with my husband. Socially, we present as an instant party. On the rare occasion when a social engagement is child-free, we either outsource childcare or divide and conquer. To be honest, it feels like we are synchronised swimmers, smiling to the audience while working our backsides off under the water…and occasionally getting water in our eyes. Would we have it any other way? Absolutely not! What’s a typical day like for your family with the juggle of work and family-life? Long! Our days are long, there is no doubt about that! We live on a farm about one hour out of Adelaide, so getting home isn’t just a quick five minute trip up the road. Lachie leaves around 5AM and returns at approximately 8PM. My days are spent with the kids, attending to house work, running errands (AKA getting coffee). I normally start on The Stolen Stylist in the evenings, which usually keeps me up until about midnight. What have you found most challenging about working in your own businesses and having a young family? Flexibility…or lack thereof! A part of me wishes I had started my business before children, when I could’ve spent countless hours every day hustling. That thought is fleeting, though, because I learnt so much from my past professions. I want to be available for my kids so now I create flexibility—my business is available when I am available and I do the background work when I can (which is mostly evenings), but often feel like an ant on hot cement jumping all over the place. What have you come to accept as the norm with such a busy life? Accepting sacrifice and compromise in our lives makes the tough days a little bit easier and the good days even better. Our family of eight is now complete (two members being our businesses), and our future is clearer but not set in stone, because you just never know what is around the corner. Crazy days get us all. How do you spend any ‘me time’? ‘Me time’ is an anomaly in my house. However, I do try to get up before anyone else to have a quiet coffee and set some intentions for the day ahead. This isn’t always possible as my second child invariably wakes me up before my alarm! Otherwise, ‘me time’ is when I am working with my clients—I really do love what I do. Favourite time of the day is … before the kids are up. I try to set my alarm for 5AM so I get some peace and solitude (and uninterrupted coffee). Instagram sites that inspire you … @sarahjane_clarke; @kit_willow; @stellamccartney; #bof. I’m happiest when … my family are all together on an outing. I’m addicted to … a good op shop find. Favourite wardrobe staple for work … this is hard, because I use everything. Let’s say jeans…oh, and a good trench in winter! Favourite wardrobe staple for weekend … dresses. My role model is … Stella McCartney.